At some point villages in Georgia started running low on festival themes. Agricultural products (peaches, peanuts, mayhaws, watermelons) had been exhausted, as had farm animals (swine, mules, honeybees), wildlife (buzzards, rattlesnakes), and flowers (azaleas, roses). So they turned to insect pests. Camilla has Gnat Days, and Ashburn has the Fire Ant Festival. And of course you can't have a festival without a parade, a queen, and a road race. Especially not without a road race! So Ashburn hosted another annual edition of the Fire Ant Festival 5K road race on Saturday morning, 26 March 2011. Albany State University athletes Robert Smith and Sherrard Thomas grabbed the top two places in the race, Smith winning in 17:52 and Thomas picking up second with an 18:13. Kurt Heninger of Fitzgerald, Georgia was the next runner in after the pair from ASU, running 18:55. Heninger was followed by Mitchell Sinyard of Hawkinsville, who edged out Leesburg's Bruce Austin for top master runner honors, 19:22 to 19:36. Another Albany State track team member helped herself to honors in the women's division. Ashley-Marie Duncan, a freshman distance runner at ASU, was the fastest female in the Fire Ant 5K, placing eighth overall in 20:46. Cordele's Heidi Taylor (14th, 22:35) and Penelope Williams (19th, 24:18) of TyTy were the next two women in, followed by the first woman master, Tifton's Gina Purvis (22nd, 25:16). Nearly 100 runners finished the race, proceeds of which went to benefit the local Child Abuse Council. Another Georgia festival race: "Seppala and Thompson win at Adel"
Starting from Legacy Park in Albany, Georgia, 148 runners set out to race around the streets of Albany on Saturday, 26 March 2011. It was the Legacy Run For Life 5K, and the first to the finish line was Trey Broome of Leesburg, Georgia, who covered the course in 17:35, just five seconds ahead of the runner-up, Bill Fricks of Albany. The top master runner in the race was Albany's Lucius Burch, who finished seventh overall in 18:38. The fastest woman of the morning was Stephanie Harris of Dawson, Georgia; Harris ran 20:38 to place 16th overall. Just eight seconds behind Harris, Albany's Cindy Dominey was the second woman finisher and the top woman master; her 20:46 was good enough to put her 20th in the overall standings. Dominey was racing less than five weeks after finishing the "26.2 With Donna" National Breast Cancer Marathon in Jacksonville, and not quite three weeks after completing the Snickers® Half Marathon in Albany. Her performance certainly didn't suffer by being in a much shorter race. An inaugural event hosted by Sherwood Baptist Church, the race was a benefit for the Alpha Pregnancy Center. 36th annual Springtime 10K, Publix 5K & Target 1-Miler. 7:45am ET one-mile / 8:10am ET 10K and 5K. Leon County Courthouse, 301 S Monroe St, Tallahassee, FL 32301. USATF certified course FL96048DL (10 km). 2010 story. 2009 story. Event web site. Event page on Facebook. Online entry at active.com. Judy Alexander, jalexander98@comcast.net or 850-383-1361. Race The Lake 5K and one-mile fun run. 8:30am CT. Deer Point Elementary School, 4800 Hwy 2321, Panama City, Florida 32404-9757. Online entry at active.com. Red Hills Triathlon (1/3-mile swim, 16-mile bike, 3.1-mile run). 7:30am ET. Maclay Gardens State Park, 3540 Thomasville Road, Tallahassee, Florida 32309. 2010 story. 2009 story. Event page on Facebook.com. Event web site. Online registration at active.com. Fourth annual Draggin’ Tail Ultra Trail Challenge 25K / 50K. 8:30 am ET. Torreya State Park, 2576 NW Torreya Park Road, Bristol, FL 32321. Joe Edgecombe, joeruns@yahoo.com or 850-774-0018 or 850-265-8439. Second annual Southern Scholarship Foundation Education for Life 5K. 3:30pm ET. Mike Long Track, Florida State University, Chieftain Way, Tallahassee, Florida. 2010 story. Event page on Facebook. Entry form and flyer. Online entry at active.com. 850-222-3833. Red Run 5K. 8:00am CT. Aaron Bessant Park (Pier Park), 8795 South Thomas Drive, Panama City Beach, Florida. Online entry at active.com. 36th annual Festival On The Rivers Five-Mile Run and one-mile fun run. 7:30am CT. Geneva Middle School, 501 North Cherokee Street, Geneva, Alabama 36340. Entry form and flyer. Greater Geneva Area Chamber of Commerce 334-684-6582 or Rhonda Stone 334-684-6725. Third annual Smiling Pig 5K. 8:00am CT. Citizens Lodge Park, 4577 Lodge Drive, Marianna, Florida 32446. Event web page. Entry form and flyer. Margo Lamb, walkrun@mariannaartsfestival.com or 850-482-7721. Minuteman 5K Trail Run. 8:00am CT. Westgate Park, 801 Recreation Road, Dothan, AL 36303. 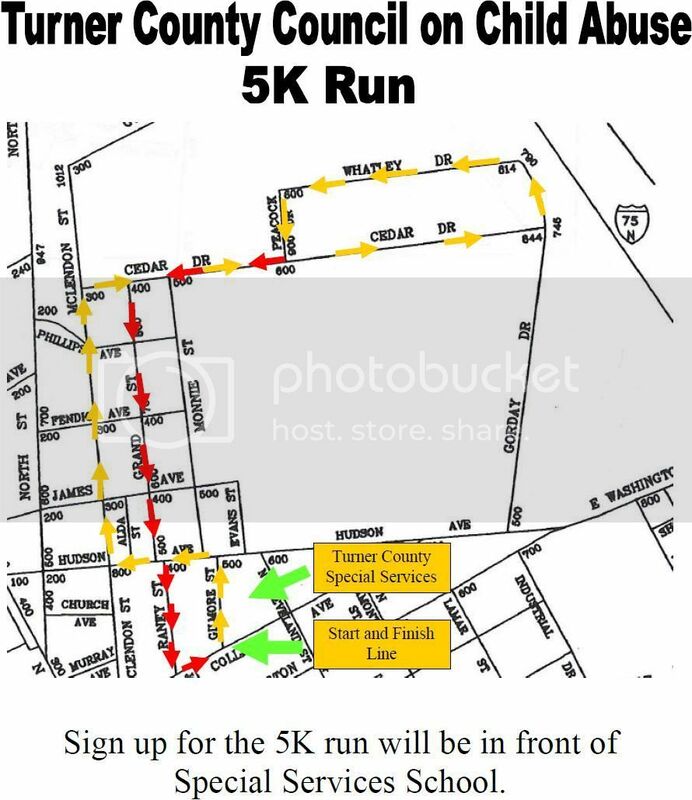 Willie Wiggins, minuteman5k@hotmail.com or 334-701-5703. White Sand Triathlon I (600m swim, 16 mile bike, 5K run). 7:30am CT. Spinnaker Beach Club, 8795 Thomas Drive, Panama City Beach, Florida 32408. Event web site. Online registration at active.com. Freedom Sports, info@myfreedomsports.com or 850-249-2120. Race For The Vets 5K. 9:00am ET. Mike Long Track, Florida State University, Tallahassee, Florida. Entry form and flyer. Online registration at active.com. Ashley Rose, adr04@fsu.edu or 727-244-6597. Semper Fi 5K. 12:00 noon ET. Woodward Plaza, Florida State University, Tallahassee, Florida. Entry form and flyer. LCpl. Tim Kruse, trk08c@fsu.edu or 407-913-5543. 37th annual Springtime 10K, Publix 5K & Target 1-Miler. 7:45am ET one-mile / 8:10am ET 10K and 5K. Leon County Courthouse, 301 S Monroe St, Tallahassee, FL 32301. 2010 story. 2009 story. Event web site. Judy Alexander, jalexander98@comcast.net or 850-383-1361. 38th annual Palace Saloon 5K. 8:00am ET. James Messer Fields Park, Jackson Bluff Road and Dupree Street, Tallahassee, FL 32304. USATF certified course FL99027DL. 2010 story. 2009 story.